A: The easiest answer is that it will take 500 years for EPS to break down under normal conditions. As a consumer nation, we use a lot of EPS in packaging (electronics, furniture, toys, appliances, food, shipping, etc.) and then pitch it, creating a problem that will stay with us for hundreds of years to come. 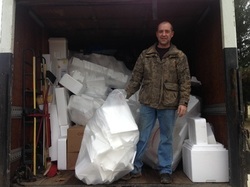 Save your styrofoam and recycle it!